Throughout the history of our country, the Armed Forces have led, fought for, and protected the American way of life and our freedom. In the military, officers are taught to lead and inspire the men and women who serve, oftentimes in high-stress and even higher-stakes situations. Those who serve often undergo rigorous physical and mental training. They apply their training in situations where sharp attention, bravery, skill, and teamwork are vital to victory and survival. That training can also transfer to business when they return home. Memorial Day, held on May 30 this year, honors the deceased veterans who made the ultimate sacrifice while serving in the Armed Forces. As the holiday approaches, lessons from our military can be applied to the changing workforce and to those seeking new careers. Basically, if a Marine who is not the leader finds himself in a situation where an immediate decision is needed, he has the authority to make a decision that best supports what he believes is his commander’s desired result. To put it simply, every Marine is trained to act instinctively and effectively in every situation. For job seekers or employees, this decisive mindset can be used in business situations that require fast thought, intelligent decision-making, and knowledge of the end result. If every employee at a company is aware of the end goal, they can make instant decisions to bring about that goal. The key, however, is leadership. Leaders must not only tell every person what that end goal is, but also provide team members with training to reach that goal. Then, they must have faith in their employees to make the right decisions. From the first moment a soldier joins the Army, he or she learns what the words loyalty, duty, respect, selflessness, service, honor, integrity, and personal courage mean. Soldiers learn these Seven Core Army Values in detail during Basic Combat Training, and those values become a part of everything they do, on or off the job. The U.S. Army is a complex machine of missions and responsibilities. One task builds into another, and by fulfilling each responsibility with integrity, success is earned. Throughout its history, the Navy has successfully met challenges, thanks to the core values of honor, courage, and commitment. In the Navy, honor means conducting oneself in the highest ethical manner in all relationships. The Navy requires sailors to be honest and truthful in all dealings both in and outside the Navy. That quality can also benefit you during your job search or at work. For instance, encouraging new ideas and being willing to make honest recommendations—whether they are popular or not—will earn a reputation of honor. Even an entry-level employee can become a leader by committing to an uncompromising code of integrity and by taking responsibility for their actions and words. Excellence is a tall order, yet airmen constantly strive for improvement in self and service to help the Air Force achieve greater goals. You too can strive for excellence by improving your skills in business. Find a mentor or volunteer to learn new tasks at your place of work. Constantly seek ways to improve your work. Take courses that will benefit your position. Be dedicated to always putting your best foot forward. Excellence in all you do is a way to take pride in your job, and also ensures the respect of your leaders and co-workers. Honor, respect, and devotion to duty are the core values for the United States Coast Guard. In today’s changing workforce, more than ever, respect is vital. Just as Guardsmen respect themselves and their shipmates, you too can treat co-workers, subordinates, or supervisors in the way you wish to be treated. Respect does not mean you should allow anyone to take advantage of you, nor does it mean tolerating behavior that demeans or hurts others in your workplace. Respect is a vital trait when working as a team. Let it guide you in treating workmates, customers, or the public with fairness, dignity, and compassion. Guardsmen encourage individual opportunity and growth, and you too can encourage creativity through empowerment in your job as well. 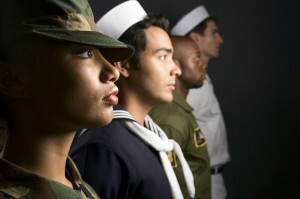 Have you ever served in the U.S. Armed Forces? Share some of your most important lessons with us in the comments section below.